With camp season in full swing, recruiting has picked up quickly, and Duke has extended offers to a number of top offensive linemen across the country, and BDN is profiling some of the top 2012 offensive line prospects on Duke’s radar. In-state recruiting has been revitalized under Head Coach David Cutcliffe, and the Blue Devils have targeted an in-state offensive lineman with a recent offer. 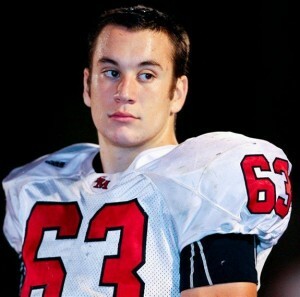 Casey Blaser is a 6’5” 261 pound offensive line prospect from Charlotte. The Blue Devils are the first ACC school to offer the hard-working lineman, who also has offers from ECU, Ball State and Marshall. In the offense we run, we do a lot of run-blocking, so I think I’m a good run-blocker. I have long arms, so that works. My footwork is ok, my technique is ok, they need to be improved. Been working on my speed and my strength, and my footwork also, those have been the three main things. For myself, just to play the best I can play and get the scholarship offer from the school I want to go to. And for the team, hopefully win a conference and state championship. I want to have a college where I feel comfortable, where I feel like I’m at home pretty much, where the coaches are like second fathers. It’s got to have good academics and just a good vibe about it. BDN: Which schools have you had the most contact with this spring? Well I’ve been talking to South Carolina, ECU, Ball State, Marshall, Illinois. Those are the teams out of the ACC. The ACC schools have been UNC, Duke, NC State, Georgia Tech, Virginia Tech, and Clemson. BDN: Have you had a chance to take any visits yet? I visited Clemson, UNC, NC State, Duke, Ball State, Illinois, I was at ECU today, and I’m planning on visiting South Carolina next week and then Georgia Tech later this summer and Virginia Tech later this summer too. I like most of the colleges, most of the colleges have good coaching staffs. I have to say of the ones I’ve visited, my favorite ones have been UNC, I really liked UNC today, and then I also liked Duke. Those have probably been my three favorite coaching staffs that I’ve gotten to visit personally. I plan on making a decision in August before the season starts, but I’m not really sure which school right now. 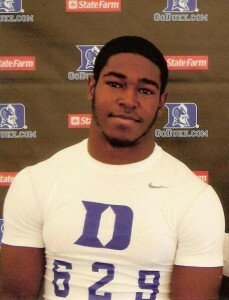 I have offers from ECU, Duke, Marshall, and Ball State. BDN: Thanks a lot, Casey, and best of luck to you.